BUTTE, Montana (CNN) -- Three families with young children were heading to a ski vacation together when their plane crashed into a cemetery in Montana, loved ones of the victims said Monday. 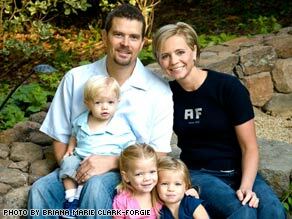 Dr. Erin Jacobson and his family, shown here in a photo from November, were killed in the crash. Federal investigators said that with no flight data recorder or cockpit voice recorder on the plane and no survivors, an investigation into what caused the crash could last months. "This is going to take a while," National Transportation Safety Board Acting Chairman Mark Rosenker said at a news conference Monday. Investigators are looking into whether the single-engine plane was overloaded, what role weather may have played in the accident and what made the pilot decide to divert to Butte, he said. He urged reporters not to "jump to conclusions" about the crash. Early speculation focused on the fact that there were 14 people aboard the 10-seat aircraft, but Rosenker said young children often travel on the laps of adult passengers and urged reporters not to rush to judgment about the cause of the crash. "To jump to conclusions is a disservice to your readers and to those who are watching your broadcasts," he said. "This will be a long and tedious investigation -- extremely thorough. We will look at every factor which could affect the performance of this aircraft." Investigators said seven adults and seven children were on board, and all died in the crash Sunday. On Monday some of the victims' relatives visited the site of the wreck. St. Helena Hospital in St. Helena, California, said an ophthalmologist who worked there was killed, along with his family. "The St. Helena Hospital family is filled with such deep sadness over the deaths of Dr. Erin Jacobson, his wife Amy, and their three children, Taylor, Ava and Jude," the hospital said in a written statement, adding, "Our thoughts and prayers are with the families and friends of each victim of this terrible tragedy." A friend of the Jacobson family said the Jacobson children were 4, 3, and 2 years of age. A dental practice in Valley Springs, California, said dentist Michael Pullen and his wife, Vanessa, were on the plane with their 9-year-old daughter, Sydney, and 7-year-old son, Christopher. The family is from Galt, California. Dr. James DuHamel of DuHamel & Pullen Family Dental said the two families were related. Vanessa Pullen, a physician in Elk Grove, was the sister of Amy Jacobson, he said. DuHamel said Pullen was "a fantastic dentist," and added that he will "miss him greatly." Adrian Cotton, whose wife is a sister of Vanessa Pullen and Amy Jacobson, is acting as a spokesman for the families. The third family was that of Dr. Brent Ching, a dentist in Chico, California, his office confirmed without providing further comment. Ching was accompanied by his wife Kristen and children Hailey, 5, and Caleb, 3, Hostetter said. Cotton said the pilot on the plane was Bud Summerfield, who was not related to any of the victims. While investigators continue to look into the crash, it is unclear whether details of what happened will ever be known. There is no requirement for a cockpit voice recorder or a flight data recorder on such private planes. Rosenker said there might be some avionics -- electronic systems that private planes can use for a variety of purposes -- that might contain some information, though they are not built to withstand crashes. Some visitors set up crosses outside the gates of the cemetery to serve as a makeshift memorial. Others brought flowers. The flight was headed to Bozeman, Montana, but was rerouted to Butte, said Federal Aviation Administration spokesman Mike Fergus. The plane crashed 500 feet short of the runway at Bert Mooney Airport. No one was injured on the ground, Sheriff John Walsh said. The plane was designed to carry 11 people -- two in the cockpit and nine in the cabin, said Rosenker. He noted that young children often travel on the laps of adult passengers. "We were just taking a ride -- all of a sudden, we watched this plane just take a nosedive," she said. "We drove into the cemetery to see if there was any way my husband could help someone. We were too late -- there was nothing to help." Her husband, Steve Guidoni, said the plane "went into the ground" and ignited a tree. A flight plan said the plane originated in Redlands, California, according to flight-tracking site FBOweb.com. Stops were made in Vacaville and Oroville, California, before the plane headed for Montana. The plane stopped at the Oroville airport about 11 a.m., refueled and departed about half an hour later, said Police Chief Kirk Trostle. The Oroville airport does not have a control tower. Eric Teitelman, Oroville's director of community development and public works, said that because it has a "wide-open runway" and a self-service fuel system, it is a frequent stop for general aviation aircraft. There were conflicting reports about ownership of the plane, which was manufactured in 2001. CNN's Auggie Martin, Dan Simon, Jim Spellman, Mike Ahlers and Irving Last contributed to this report.